Another collection of Box Tops for Education will begin on Monday, February 3rd. Once again we are tracking the number of box tops that each class collects and are offering a Pizza Party to the class who collects the most box tops. As always, we appreciate you collecting the box tops, filling out the Box Top sheets that your child brings home, and sending them back to school. Box Tops for Education are each worth 10 cents in cash and will be used to purchase items for the students. We have recently ordered some new soccer, footballs, and playground balls. The students and teachers at Chadron Primary celebrated January 27th, the 100th day of school, in a variety of creative ways. Mrs. Landreth's students did 100 exercises, enjoyed centers with 10 items in them, made 100 Days crowns and glasses, counted to 100 by 1's, 2's, 5's, and 10's, ate a snack with 100 different food items in it, and read the story "Kindergarten Counts to 100." Mrs. Brayton's students counted to 100 by 1's, 5's, and 10's, decorated 100 Days crowns, observed 100 seconds of silence, brought collections of 100 items, made necklaces with 100 pieces of Fruit Loop cereal, glued 100 Cheerios onto a paper bowl and 100 pieces of popcorn on a paper corncob, put items into groups of 10's, learned that 100 pennies (cents) equals $1.00, and read the story "Twas the Night Before the 100th Day of School." Mrs. Hoffman's students wore a shirt with 100 items on them that they decorated at home, used their sorting mats to put 100 Fruit Loops into groups of 10, counted out 100 Fruit Loops and made a necklace out of them, made a stamp book with 100 stamps in it with 10 stamps on each page, jumped for 100 seconds, counted to 100 by 1's, 5's, and 10's, built a tower out of 100 Solo cups, had a snack made out of 100 food items that the students brought, and watch the video clip "100 Hungry Ants." Mrs. Fisher's students wore a shirt with 100 items on them that they decorated at home, colored crowns and glasses, counted by 5's and 10's to 100, ate Trail Mix with the 100 food items that the students brought, and read a story about 100 days of school. Mrs. Ferguson's students put together a 100 piece puzzle, counted out 100 legos and each student built something with them, made creations with 100 Solo cups, wrote their name as many times as they could in 100 seconds, colored 100 Days ties, drew a picture of what they might look like when they are 100 years old, and read a story and sang a song about the 100th day of school. Mrs. Claussen's students wrote their name as many times as they could in 100 seconds, did 100 jumping jacks, recited the ABC's, counted to 10, and gave "high fives" as many times as they could in 100 seconds, stood up and sat down 100 times, followed directions on a 100 chart's mystery picture, drew a picture of what they would look like when they were 100 years old, sange a 100 days song, and brought 100 food items for a Trail Mix snack. Mrs. Bounous' students did several activities in 100 day math, wrote a story about when they were 100 years old, listened to a story about the 100th Day of School, and enjoyed a treat. Mrs. Gardner's students did M&M math (sorted, counted, graphed) with 100 M&M's, counted by 5's and 10's to 100, exercised for 100 seconds, wrote the numbers 1-100, flipped a coin 100 times and recorded the data, rolled dice and counted the number of tally marks to see who reached 100 first, brought 100 items, made Chex Mix with 100 of each food item, read the story "The 100th Day of School." Mrs. Hudson's students counted by 1's, 2's, 5's, and 10's to 100, read a poem and listened to a story about the 100th Day of School, completed the "100th Day News which included drawing a picture of what they looked like today and how they thought they would look in 100 years, how old they would be in 100 years, what they hoped they would own 100 of, would they would not want to own 100 of, what they would like to be in 100 years, and what they would do if they had $100. Mrs. Hendrickson's student's brought 100 of a food item for Trail Mix, filled out a 100's number chart, checked to see how many exercises they could do in 100 seconds, drew a picture of what they would look like when they are 100 years old, wrote a story about what they would do with $100, and made as many words as they could out of the words "One Hundred." Mrs. Uhing's students had to find 100 Hershey Kisses hid in their classroom and then put them in order from 1-100, divided the kisses into 18 for each student to eat, drew a picture of what they thought they would look like at the age of 100, chewed a piece of gum 100 times and determined who blew the biggest bubble. Mrs. Cogdill's students wrote 100 words using the letters in their Sonday lesson and winners got a fake $100 bill, divided 100 jelly beans into two groups and ate them. Whatever the activity in each classroom, the students had a lot of fun participating. Mrs. Brayton's, Mrs. Bounous', & Mrs.
Congratulations, students, for your great attendance. We hope that your attendance remains perfect until the end of the school year! 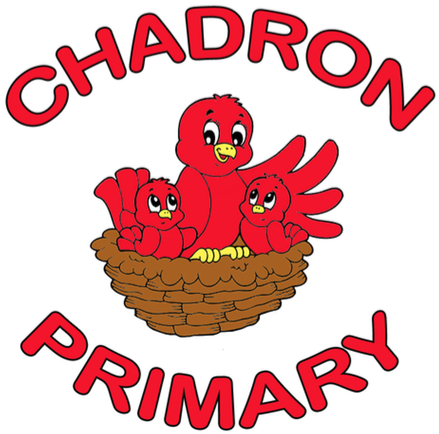 The Parent-Teacher Conferences at Chadron Primary will be held on Monday and Tuesday, February 3rd and 4th, from 3:00-7:00 each evening. Parents whose child's last name begins with L-Z are scheduled from 3:00-5:00 P.M. either evening and parents whose child's last name begins with A-K are scheduled from 5:00-7:00 P.M. either evening. 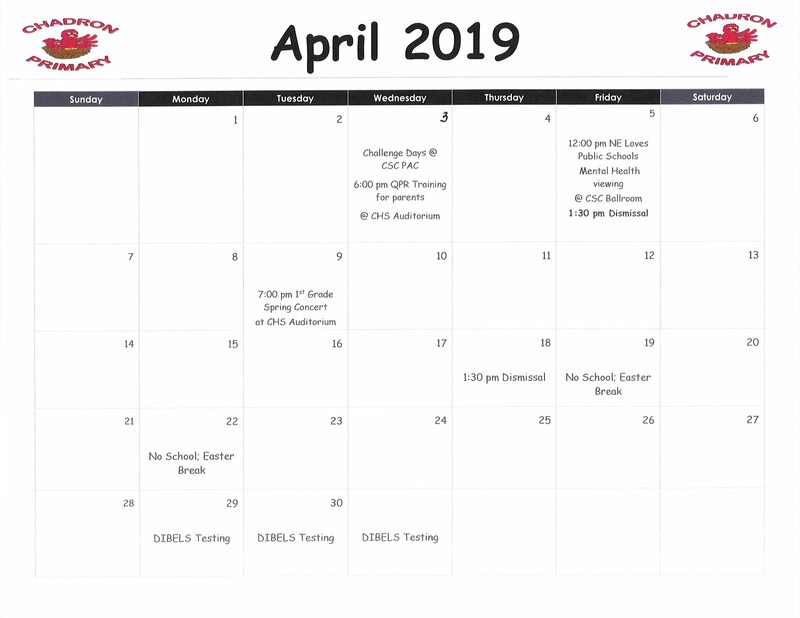 If you are not able to conference with your child's teacher(s) during the scheduled time, please come at a different time during those evenings or call your child's teacher at 432-0710 to schedule an alternative appointment. School will be dismissed at 1:30 P.M. on both February 3rd and 4th. There will not be Just for Kids After School Program on those days. School will not be in session on Friday, February 7th, due to the conferences. If you have a child transitioning into kindergarten the fall of 2014, you are invited to become part of this worthwhile program. This is an opportunity for the whole family to participate every Monday evening for eight weeks. Each session offers free dinners, child activities, and parent group time. Once during the eight week session, each family will also receive a $50 Lottery Basket. The next phase of the FAST Program will begin on Monday, February 24th, and will continue until Monday, April 14th at the Chadron Primary Building. There is limited space available. If you are interested in participating, please obtain an application form from the Chadron Primary School Office at 732 Ann Street or the Office of the Superintendent at 602 East 10th Street. After you have filled out the application, please return it to your child's preschool teacher, daycare provider, Chadron Primary School, or the Superintendent's Office by Monday, February 3rd. This is a great opportunity that you won't want to miss out on.